The chart on the right hand side shows the ten IT Services suppliers with the highest profile in analyst research over the last six weeks. It is an extract from the Lighthouse Services Index, one of our monthly share of voice measurements , which we call the Analyst Index service. 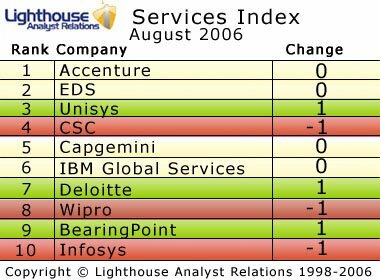 With just one place changing hands in the top 5, life in the upper divisions of the IT Service Index seems relatively still. Naturally, with Accenture and EDS lurking the top spots, it is hardly surprising that we see such little movement. However, gainers of analyst focus are Unisys, Deloitte and Bearing Point, ascending by 1 place, and LogicaCMG climbing up by 2 positions. More notable gainers this month are Verisign and SAIC both ascending by 3 positions. On the contrary Equant is the only firm showing any substantial decline descending to the number 23, from position number 26. We also keep an eye out for the companies that dropped out from our top 25 list. Astonishingly none fell out this month. ← What’s an analyst’s name-check worth?